Having a baby means your anxiety levels go through the roof. Whether your baby is awake or asleep, you just have the urge to constantly see and hear them. While not really possible or healthy, it is hard to fight this urge. Thankfully, the world of gadgets we live in has made our lives slightly easier. A baby monitor is one such gadget that helps find a balance between this urge and the need to live your own life. They come in all flavours and forms. The device comes in 2 parts. The base unit, which does all the hard work, and the remote which is portable and let’s you listen in. Both of them are roughly the same size, and will fit happily on the palm of your hand. The over all build for both is similar, and they easily look like they belong together. The base unit has a power plug near the bottom which allows you to plug it into mains. On top is a bunch of buttons, a projecting lens as well as a mesh for some speakers, shaped in stars and moons patterns. Above it protrudes an antenna, which houses a temperature sensor. The remote’s shape has a similar inspiration. It has a 2″ screen on top, a bunch of buttons below and a speaker mesh with the same star and moon pattern as the base unit. It also houses a charging port to allow you to charge the batteries inside. Below it is a tab that allows you to get the batteries in and out. You don’t normally need to do this. It is rather handy that the base unit and the remote both come with the same charger. It is also rather handy that both come with a 2-meter long cable. This means that generally, no matter where your power socket is in relation to the child/baby, you should be able to place the unit accordingly. While I am on the topic, the battery life of the remote does disappoint. With no actual action happening, it will remain alive for a couple of days. With a busy night, you’re looking at less than a day of battery life. Think of it like a phone, it needs to be charged while your baby is not asleep. Since it can charge from the same unit as the base, I often ended up unplugging the base cable and plugging it into the remote. That meant the remote was always by the base unit and didn’t go missing when not in use. It also meant that when I engaged the base unit, the remote was right there. The setup is pretty minimal. Take your items out of the box. Insert the batteries into the remote. Turn both items on using the power button. From there, it links straight away. If configured correctly, the easiest way to use this is via the base unit. It contains handy buttons for night light, music and light show. Pressing the night light button will also let you adjust it. However, you need the remote to configure it. That is reliant on an archaic menu system that is pretty slow. It is intuitive, but a few more buttons would have helped. I know the idea is that you set and forget, but with parents who are already sleep and rest deprived, this can be an issue. 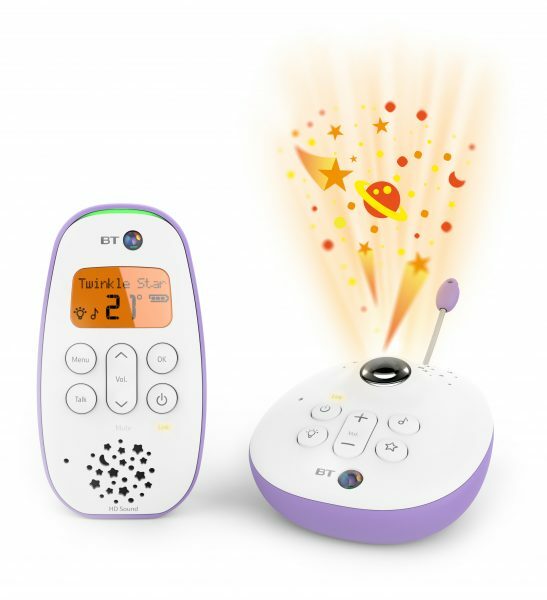 The remote allows you to configure how the light works, the light show, and most importantly, what music plays for your baby. It also allows you to configure settings around alerts. The device does come with a reasonably detailed manual that explains everything. Whether you have the time or energy to refer to it is a different matter. The device may come with many features, but if it fails here, you’ll probably need another. I have to say, this feature works really well. Remarkably well, in fact. If placed close enough, even movements by our baby are detected. Two way talk works well too, and I found it working in all 4 corners of my house, including the far end of the garden. There is also a handy LED that indicates sounds/crying, accompanied with an icon on the screen. This allows you to turn the sound on. This is particularly useful if you plan a quiet night in with a movie on the telly, and the lights at low. The lullabies are a handy feature. They work well. The white noise, which seems to be our baby’s favourite, is rather soft, meaning it doesn’t soothe her as much as she needs. Classical music works well though. You can adjust the volume via the base unit. One slight niggle. The sound the baby monitor makes can trigger the crying alert on the remote. Bit of noise cancelling tech needed. This one was rather disappointing. The night light was far too dim to be useful. It is just about bright enough to know that there is a glowing source somewhere in the room, but not enough to actually see something. Having just gone through a heat spell, this one was particularly important to us. It gives an alarm when the room your baby is in is above 25 degrees. As the outside temperature was above 37, the alarm pretty much became a nuisance for us. However, under normal conditions, it provides a handy read out of what is happening around your baby. Saving the best for the last. This is definitely a favourite feature of mine. It works well and looks really beautiful. If I had to be nitpicky, I would say that the stars/moon/sheep patterns looked very slightly out of focus. There are no instructions to indicate if there is a way to adjust this. More information on the device can be found on BT’s website. It retails for around £40 (down from £49.99) and can be bought from various online retailers such as Amazon. This is not the perfect device, but it is pretty perfect as a baby monitor. This along with the extras and the decent price make it a device worthy of your consideration. I am definitely hanging on to mine.